Is it important to express yourself, fully? Or is most anger more damaging (to yourself) than beneficial? What is your assessment of anger? Hmm, well I can't promise to answer any of these questions but I can promise you a hand-picked (by me) collection of inspirational anger quotations that might help YOU answer them! You'll also find sneaky links to find out more about a particular subject, should it be relevant. "The worst-tempered people I've ever met were people who knew they were wrong." 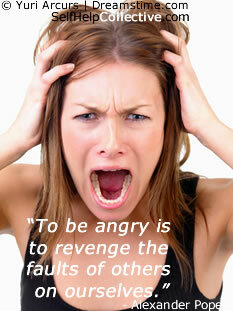 "To be angry is to revenge the faults of others on ourselves." "Great anger is more destructive than the sword." "Anger is a great force. If you control it, it can be transmuted into a power which can move the whole world." "How often it is that the angry man rages denial of what his inner self is telling him." First they would make angry"
"Fair peace becomes men; ferocious anger belongs to beasts." "He who angers you conquers you." "Anyone can become angry. That is easy. But to be angry with the right person, to the right degree, at the right time, for the right purpose and in the right way - that is not easy." "There is nothing more galling to angry people than the coolness of those on whom they wish to vent their spleen." "If a small thing has the power to make you angry, does that not indicate something about your size?" "There was never an angry man that thought his anger unjust." "Anger makes you smaller, while forgiveness forces you to grow beyond what you were." "He that would be angry and sin not, must not be angry with anything but sin." "If you kick a stone in anger, you'll hurt your own foot." "Consider how much more you often suffer from your anger and grief, than from those very things for which you are angry and grieved." "Accidents are no accidents. Like everything else in our lives, we create them. Accidents are expressions of anger. They indicate built-up frustrations resulting from not feeling the freedom to speak up for one's self." I told it not, my wrath did grow." "He is a fool who cannot be angry; but he is a wise man who will not." "Two things a man should never be angry at: What he can help, and what he cannot help." "Expressing anger is a form of public littering." "To rule one's anger is well; to prevent it is still better." "Don't hold to anger, hurt or pain. They steal your energy and keep you from love." "Do not teach your children never to be angry; teach them how to be angry." "Anybody can become angry, that is easy; but to be angry with the right person, and to the right degree, and at the right time, and for the right purpose, and in the right way, that is not within everybody's power, that is not easy." "Anger at lies lasts forever. Anger at truth can't last." "Life is too short to hold a grudge, also too long." "Holding on to anger is like grasping a hot coal with the intent of throwing it at someone else; you are the one who gets burned." "Resentment is an extremely bitter diet, and eventually poisonous. I have no desire to make my own toxins." "For every minute you are angry, you lose sixty seconds of happiness." "Men are like steel: when they lose their temper, they lose their worth." "Be not angry that you cannot make others as you wish them to be, since you cannot make yourself as you wish to be." "To carry a grudge is like being stung to death by one bee." "Anger is a killing thing: it kills the man who angers, for each rage leaves him less than he had been before - it takes something from him." "Anger is one letter short of danger." "Always write angry letters to your enemies. Never mail them." "If you are patient in one moment of anger, you will escape a hundred days of sorrow." "Not the fastest horse can catch a word spoken in anger." "Speak when you are angry--and you will make the best speech you'll ever regret." "Never forget what a man says to you when he is angry." "Anger is a signal, and one worth listening to." "Your vision will become clear only when you can look into your heart. He who looks outside, only dreams, he who looks inside, also awakens." "Let us not look back in anger or forward in fear, but around in awareness." "When angry, count ten before you speak; if very angry, a hundred." "The angry people are those people who are most afraid." "I was angry with my friend I told my wrath, my wrath did end. I was angry with my foe, I told it not, my wrath did grow." "Usually when people are sad, they don't do anything. They just cry over their condition. But when they get angry, they bring about a change." "Sometimes when I'm angry I have the right to be angry, but that doesn't give me the right to be cruel." "Anger as soon as fed is dead - 'Tis starving makes it fat." "If you would cure anger, do not feed it. Say to yourself: 'I used to be angry every day; then every other day; now only every third or fourth day.' When you reach thirty days offer a sacrifice of thanksgiving to the gods." "If you're angry at a loved one, hug that person. And mean it. You may not want to hug - which is all the more reason to do so. It's hard to stay angry when someone shows they love you, and that's precisely what happens when we hug each other." "Anger is as a stone cast into a wasp's nest." "No man can think clearly when his fists are clenched." Share this anger quotes page - thanks!